As expected, there are some new camp offers to go over on the 2012 Big Board, and they will likely keep coming in over the next few days so stay tuned. I have also finally gotten around to going over the very earliest offers on the 2013 Big Board, two for the price of one! Jarron Jones is a huge defensive line prospect with offers from just about everyone. He is currently committed to Penn State but is considered a soft commit and is looking around. It seems unlikely that he ends up in Columbus, but it would be pretty funny if he went somewhere other than Happy Valley. Herbert Waters is a WR prospect with outstanding quickness to go along with above average size. Coach Drayton apparently offered Waters after seeing him in person, and in person offers are always a good sign for a players ability. Tyvis Powell is a big, physical defensive back prospect that is not afraid of contact. Let me emphasize that he is big again. You can’t teach a player to be 6’4″, so he has that going for him. Powell lines up at CB and S in his highlight film. With his size, it seems likely that he ends up at S, but if he is able to play CB at the next level that would be pretty incredible. He earned an offer at camp, and with Ohio State’s track record in the secondary, you have to be excited by that. 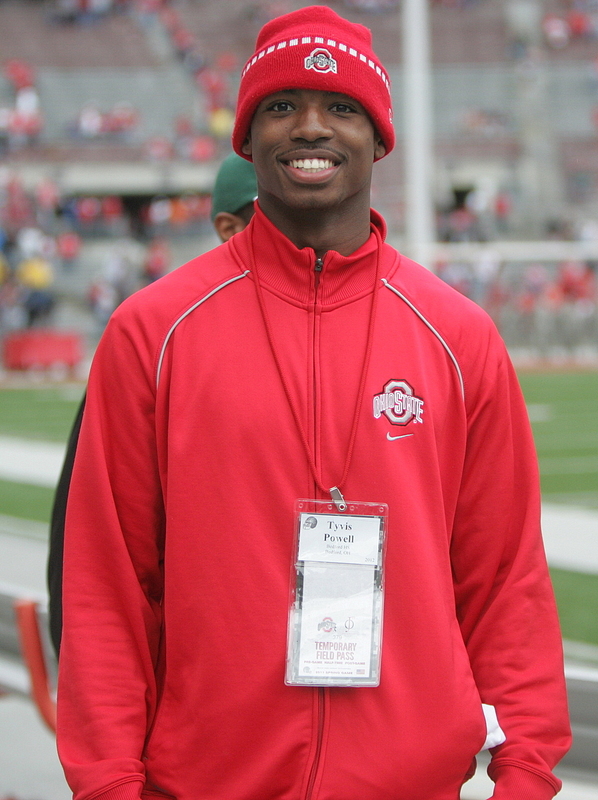 Tyvis Powell will very likely be wearing scarlet and gray in the future, and we will know for sure soon($). Ondre Pipkins is a big DT prospect that is being pursued by some major programs across the country. It is yet to be determined what his interest is in Ohio State, so stay tuned. He won defensive line MVP at camp in Columbus over the weekend. Cameron Burrows is a big time defensive back prospect in the class of 2013. His highlight video speaks for itself so it is nice to see the Buckeyes getting in early with an offer. Billy Price is one of the top defensive linemen in Ohio in 2013 that the Buckeyes extended an early offer to. Receiving the offer was “a dream come true” and although he says he will go through the recruiting process, it is hard to see him ending up anywhere but Columbus. Based on the early offers, it is clear that Henry Poggi is one of the top prospects in the country for the 2013 class. It will be interesting to see where this recruitment goes, as Ohio State has targeted multiple players from Gilman School over the past several years, so hopefully that gives them a bit of an advantage here. Richard Benjamin’s offer sheet speaks for itself. It is pretty amazing, particularly when you consider how early it is for the 2013 class. Benjamin would obviously be a great get, but with so much interest, it is hard seeing him heading to Columbus. We will have to wait and see. MI CB Terry Richardson committed to Michigan. Tyvis Powell will make his college decision on June 3rd. I would be shocked if he isn’t the newest Buckeye on that day. Tyvis Powell has tweeted to Adam Jardy that his college choice “has been delayed to Wednesday, June 1st”. Thanks for the clarification. Whatever day it is, Buckeye.